Lactose intolerance means the inability to digest the lactose present in milk. This occurs because the small intestine doesn’t make enough lactase – an enzyme required to break down lactose present in milk. The intensity of intolerance to milk varies from one person to another. Some people cannot digest any form of milk and its product while some can handle small amounts of milk and its products especially curds as it is probiotic. Thus smoothies made with curds would be a better option than milkshakes made with milk. Butter if not tolerable can be substituted with Peanut Butter or Coconut Butter with Desiccated Coconut. Largely all individuals produce enough lactose. However some cannot due to genetic reasons or sometimes even due to defects in the lining of the small intestine. While this can be easily controlled by avoiding milk and its products, one has to be careful of making up for their calcium and vitamin D requirement, especially if you’re a vegetarian. Try and add greens to add on some calcium to your diet. • Oats milk: This is a good source of fiber and can easily made at home. Try recipes Homemade Oat Milk and Pear Rabdi with Oats Milk. • Coconut Milk : While readymade coconut milk is available, it is always advisable for lactose intolerant people to make their own recipe in their own kitchen. We have shared a recipe which is definitely worth trying. If you are amongst those who love milkshakes try Avocado Coconut Milk Vegan Smoothie. 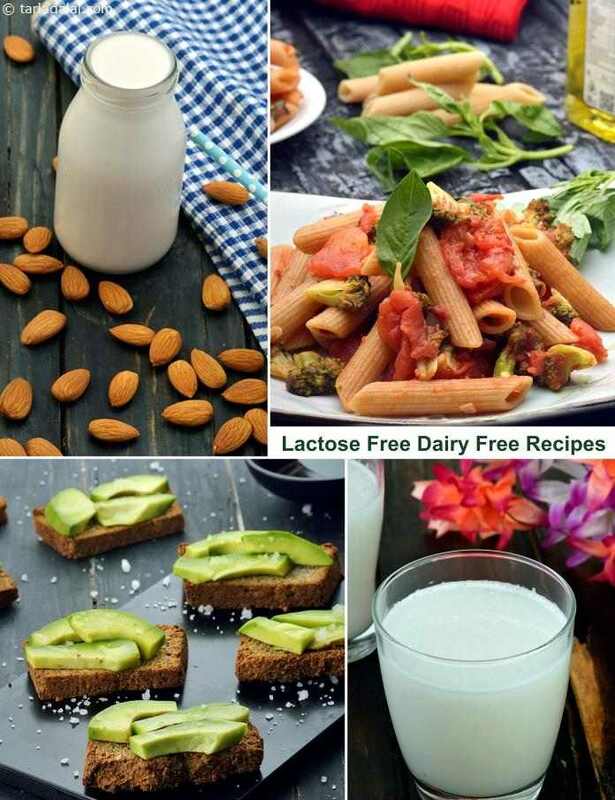 • Almond Milk: This is one the tastiest options to milk for those suffering from lactose intolerance. Do try your hand at recipes of Almond Milk and Vegan Amaranth Almond Milk and Apple Porridge. • Soya Milk: Made from soyabeans it is devoid of lactose and thus another substitute to milk. It is always advisable to check the food label of any packaged food like instant soup and porridge to be assured of the ingredients that make up that food. Homemade Oat Milk is a tasty beverage with the soothing flavour of oats. It is a great alternative for lactose intolerant people, and can even be stored in an airtight container in the fridge for one day. Just make sure you use a muslin cloth over your strainer, to get a thin and proper milk.